Football: it’s a funny old game, a game of 2 halves, and many other obligatory clichés that lead us to question the IQ of the football world at times. But at the end of the day, football is fun, and there have indeed been some frankly fabulous fun football games (try saying that fast) from years and gaming generations past. Until they went all serious with simulations, leaving us with a somewhat needless PES and FIFA comparison year in, year out of course. Before the original FIFA Soccer for Sega Mega Drive/Genesis, there were little if no simulations to speak of; most were arcade interpretations of the world’s most popular sport. 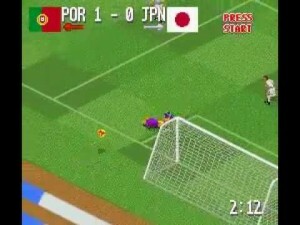 The SNES never truly had a great football sim until Konami’s International Superstar Soccer came along. The port of the Sega Mega Drive/Genesis FIFA was weak and frankly didn’t fit in the catalogue, which is a fair reflection on all of EA Sports’ simulations for Nintendo’s 16 bit beast. But of these arcade efforts were a few fun gems, and that’s why this edition of Retroreflection is doing what many flailing football fans do: look to the past. Fever Pitch was hardly a simulation, but ironically simulation itself was one of the many ‘skills’ on offer in what was a superbly slapstick football/soccer video game. Your team was made up of rough and ready ragamuffins, each with a dirty skill (diver, banana shot, fireball shot) that can (or will) be used, as desired, to win at all costs. In practice it made for some frankly ridiculous scores on the board, but you’d be too busy laughing at players diving all over the place to even notice. Unlike today’s FIFA/PES which are basically the same year in, year out and expected to be littered with various game modes just to garner decent reviews/sales, Fever Pitch was made to be switched on to enjoy 1-2 hours of pure fun at a time. Although it’s over 20 years old, for me it is still a perfect example that football video games shouldn’t have to take themselves so seriously. And Fever Pitch Soccer does that perfectly. Wrecker of relationships, destroyer of social lives, all for the chance to live the dream: to see your team win, all achieved by your hand and yours alone. I’ve known girlfriends be bribed with presents just to secure a day of play on Football Manager. A somewhat unimpressive feat for sure, but not to a Football Manager Player. Forget all the depth, the fact you can train each single player individually how you wish, manage any team in almost any league imaginable, do the unthinkable (yes, even Liverpool winning the Premier League). Football Manager doesn’t take itself seriously, it leaves it open for the player to decide if they want to take it seriously or not. Not many video games can lay that gauntlet down and succeed. I am a semi-retired Football Manager Player myself, but it is a series so consistent that I would easily be able to jump back in if I so wished. Maybe just one more month before bed won’t hurt. What’s the worst that could happen? Holy hell I lost a lot of my youth on this game. Perfectly balancing the core features of football management and arcade football only the 90’s could provide, Sensible World of Soccer was/is indeed the best of both worlds; either manage a team, train and buy players and watch the games, or same again but play out the outcome. Using the old-school up and down pitch view, the football on offer is fast and fun, and while it will never compete with FIFA for realistic gameplay or Football Manager exhaustive stat-heaven, the beauty of it that it never needed to. Despite being released in 1994 patches are still being released for PC for the latest Premier League squads, which is a testament to the games legacy as quite possible the most fun football game in existence, and no sequel could improve it. Still available on Xbox Live also, and enhanced in HD goodness, it’s a bargain at under a tenner. And although it is the last game in the series in almost 10 years, it’s still top of the league, and any football fan would be mad not to check it out.